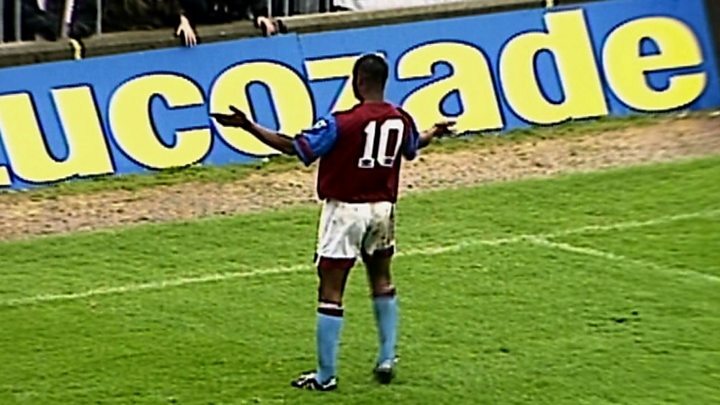 Former footballer Dalian Atkinson has died after being shot with a Taser by police at his father's house. Police said the weapon was deployed at about 01:30 BST in Telford, Shropshire after officers were called to a report of concern for a man's safety. A neighbour described seeing the former Aston Villa star, 48, being Tasered after "stumbling towards" police. Mr Atkinson went into cardiac arrest on his way to hospital, where he was pronounced dead at about 03:00. Paula Quinn, who lives in a first-floor flat near the Atkinson property in Trench, said: "They were shouting and kicking so much all I could hear were the boots hitting him. The death has been referred to the police watchdog, the Independent Police Complaints Commission (IPCC). It declined to comment on Ms Quinn's claims, but said the "the level and type of force used" was one of the elements of its investigation into police contact with Mr Atkinson before his death. Ms Quinn was the only eyewitness spoken to by the BBC who reported seeing officers kick Mr Atkinson or use the Taser while he was on the ground. She had earlier told the Shropshire Star Mr Atkinson had "seemed a bit, perhaps, inebriated", adding: "As the Taser hit him in the stomach he just went 'doof', down like a lead balloon." Paramedics said Mr Atkinson went into cardiac arrest on his way to hospital. His nephew, Fabian, said the former footballer was having dialysis treatment for kidney problems: "And obviously that's inevitably why his heart was weaker. "They need to, as soon as they deploy a Taser, they need to deploy an ambulance. As soon as, it should be mandatory. "Because, how do they know, unnaturally putting volts through a body, how do they know they're going to survive that, eventually, in the long run, that they're not going to need any medical attention?" Mr Atkinson is best remembered for scoring the Match of the Day goal of the season in the 1992-93 campaign - the inaugural Premier League season. Memorably, the Villa star dribbled the ball from inside his own half before chipping the Wimbledon keeper from the edge of the area. Ipswich Town, where the footballer started his career, tweeted his death was "terribly sad news". Aston Villa, for whom the striker scored in the club's 3-1 defeat of Manchester United in the 1994 League Cup final, tweeted: "RIP Dalian Atkinson. You'll never be forgotten!" Villa legend Paul McGrath also tweeted his reaction, describing his former team-mate as a "huge part of the Villa family", while former Villa winger Tony Daley described it as "devastating news". Former manager at Villa and Sheffield Wednesday Ron Atkinson said: "He was popular in the dressing room, had terrific ability and did it in the big games." West Midlands Ambulance Service crews called by West Mercia Police arrived to find a man had been Tasered. "As he was being conveyed to Princess Royal Hospital, his condition deteriorated and he went into cardiac arrest," a spokesman said. Neighbours Tina and Matthew Bothwell told BBC News their son had heard "a bang and shouting" outside on Sunday night but thought nothing of it. "We woke up just before seven, and saw all the police outside and police just said it's all cordoned off," Mr Bothwell said. Ms Bothwell said they had been told "someone had been Tasered and passed away". Mr Bothwell, 43, said the former striker was a popular visitor to the neighbourhood. He said: "Every time he would come he would have crowds around him. It's a close-knit community. "I just can't bear to think what his family are going through." In a statement, the IPCC said "a full and thorough investigation" was taking place. "At this stage the IPCC is aware a Taser was used on the man before he became ill," it said. The IPCC also said that since releasing its Taser report covering 2004-2013, it was aware of two inquest verdicts that have found police use of Taser played a significant or material part in a death. It added that it was already investigating four deaths before which a Taser was discharged. Police and Crime Commissioner for the West Mercia force John Campion said his thoughts were with the former footballer's family. He added: "It is an important part of my role to hold the police to account. "I want to be absolutely clear and reassure our communities that I will be doing that fairly and proportionately with regard to this incident once the full facts are available."